The product ingredients: honey, propolis tincture and thyme tincture. 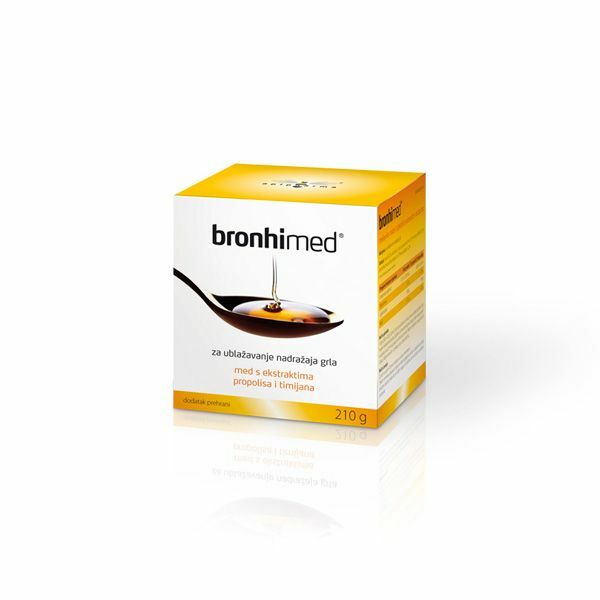 Bronhi med is an excellent combination of natural ingredients which, due to its antimicrobial effects of honey and propolis, sooths throat irritation thus facilitating the regeneration of pharynx’s mucous membrane. Thyme tincture is active as an expec- torant, that is, it facilitates the excretion of bron- chial phlegm. on induced by cigarette smoking – long-lasting coughing in smokers. To take one teaspoon of honey mixture 3 to 5 times a day (or more, if needed) before meals. Maintain it in the mouth until it slowly melt. To increase the effect, do not eat or rinse the mouth afterwards for 20 minutes. Honey mixture is also suitable for chil- dren, as well as for the utilization along with the medicines prescribed by the medical doctor. Depending on the character of health disorders, it can be combined with propolis drops and Apipro propolis spray.